Worms. There’s just something about them that makes little boys giggle. 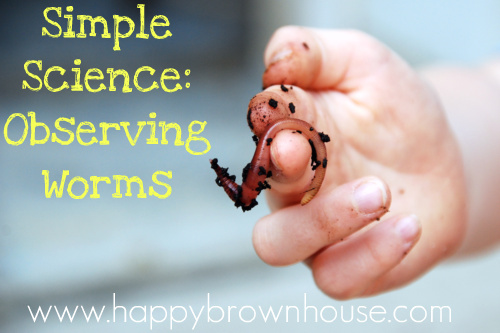 Observing worms is a simple science activity because you don’t need any fancy tools! Since worms are underground, it’s hard to see them making tunnels in their natural habitat, unless you set up an observation. Jonah and I had fun setting up a worm habitat to get a closer look at their tunnels. This is what your jar should look like when you are done. Now it is time to handle some wiggly worms! You can either dig in your yard or go to the bait shop to get worms. We just went to the bait shop and grabbed a cup of worms. After we are finished with them, we are going to go fishing at a friend’s house. Jonah thought it was hilarious that you keep the worms in the refrigerator until you use them. Place a few worms in the jar. 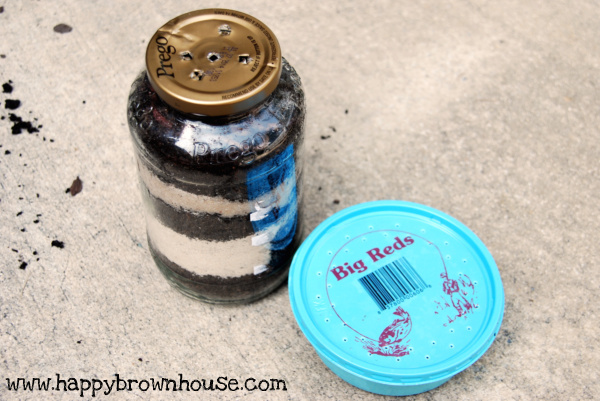 Poke a few holes in the lid of your jar. We used a hammer and nail to get the job done. 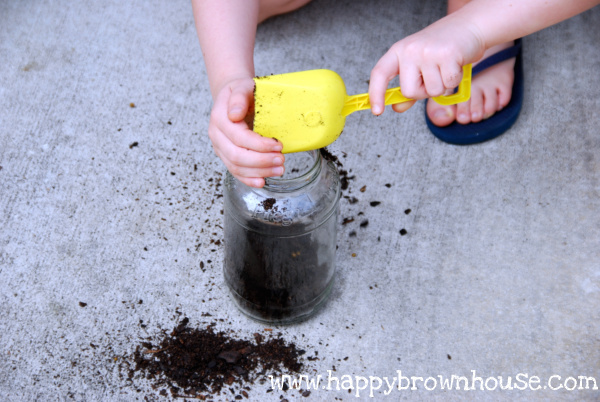 To trick the worms into thinking they are underground, place a piece of black construction paper around the jar and tape it. Remember not to tape it too tight so you can remove it to observe your worms. Give the worms some time to dig. Then, you can remove the paper and see the tunnels! You can keep the worms in the jar for a few days. Spray the soil with water to keep the soil damp. Not too much to drown them, but just enough to keep them from drying out. Since worms break down things, you can place small bits of carrots, leaves, banana peels, etc. in the jar. Jonah had a lot of fun watching the worms, and gave them a special place in the middle of the table. 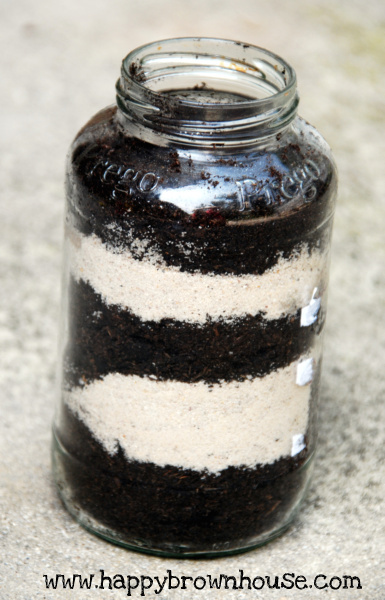 Jonah said the worm habitat jar reminded him of the ant farm we did several months ago. This was a perfect time to compare and contrast! Of course, he is still a typical six year old boy fascinated with the truth about dirt and worm poop. Here’s the journal writing to prove it…. Check out our 10 Books About Worms list for your next trip to the library. 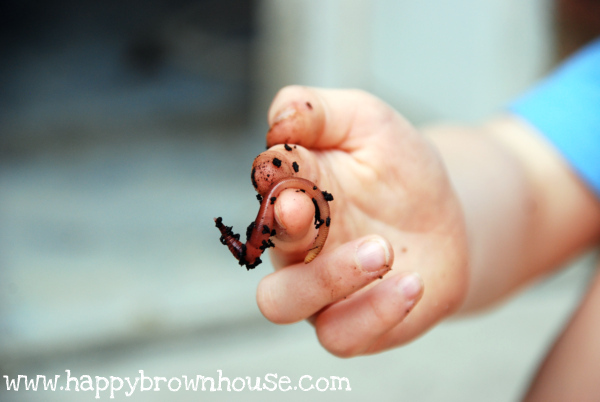 My friend Maureen from Spell Outloud has a printable worm observation in her new ebook Nature Study Printables for Toddlers and Preschoolers. It is fabulous! We are using it as a resource for our Nature Study Exploration Days this year. From the Hive has some adorable worm ideas for an entire Worm Unit! Have a wiggly day! 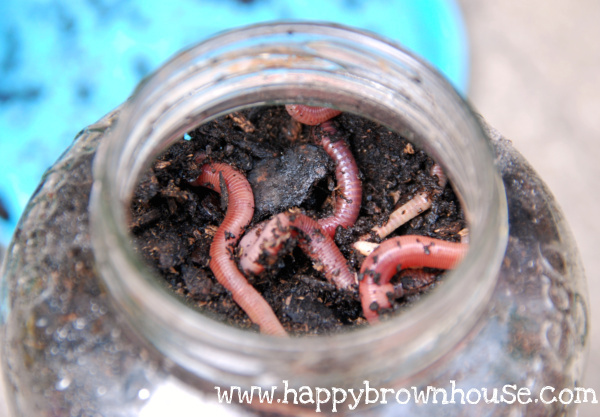 Be honest…do worms gross you out? Looks like you guys had lots of fun. 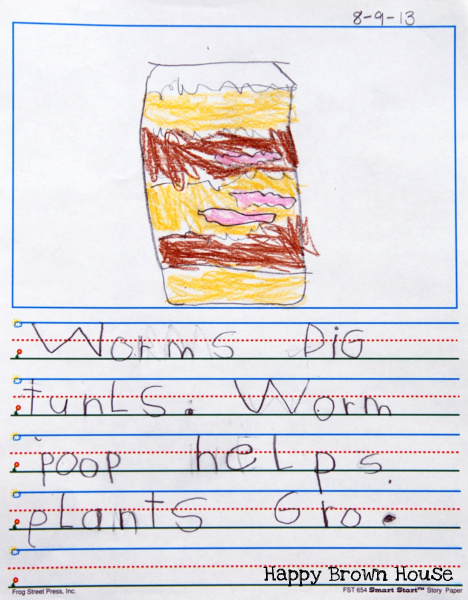 Love that you made the worm habitat and the journal entry is great! Thanks Marci! I was hoping you’d see this! Jonah has loved the worm unit! 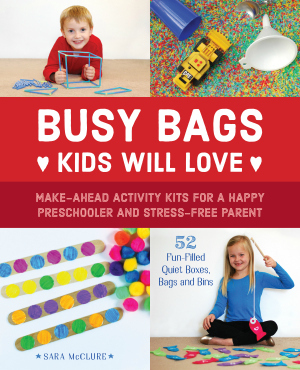 We love doing this too. I love how you explained how to do it…great post.